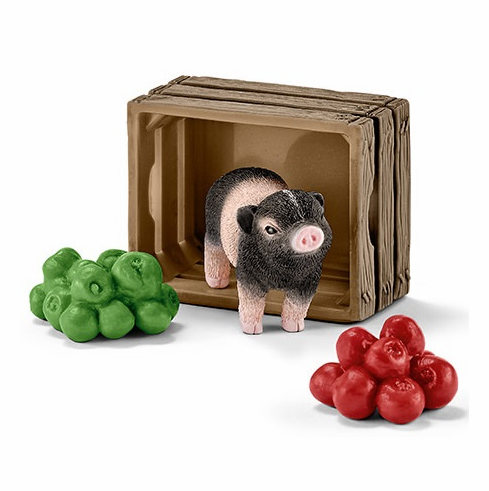 Schleich - Mini Pig w/ Apples. Includes Pig, Green Apples, Red Apples and Crate. Mini Pig measure about 1" snout to curly tail. Miniature pigs love to eat crunchy apples, clover, grains, dry feed, green fruits and vegetables like cucumbers, courgettes, lettuce and broccoli. They are extremely active and love playing out in the garden. When it gets really hot in the summer, they like to wallow in a mud hole to cool down and then take a nap. Miniature pigs are very affectionate and love getting stroked a lot, just like cats and dogs. If they like something, they lovingly prod their owner with their snout.